This was a chocolate on our wish-to-try list recently, and finally picked up a bar. In Somerville, MA, (Suhmahville) these chocolatiers use and grind organic cocao beans using Oaxacan stone mills, in a traditional mexican-style process. The result is a grittier, richer mouthfeel chocolate. This is a refreshing change from the more traditional-style chocolate bars that typically include cocoa butter (or oils or things that really should not be in a chocolate bar), so that in turn means your mouth can enjoy a more pure experience. The only other bar made with this process that we’ve had is the Casa Don Puglisi Chilli, a bar made from cold-pressed ground beans and sugar. 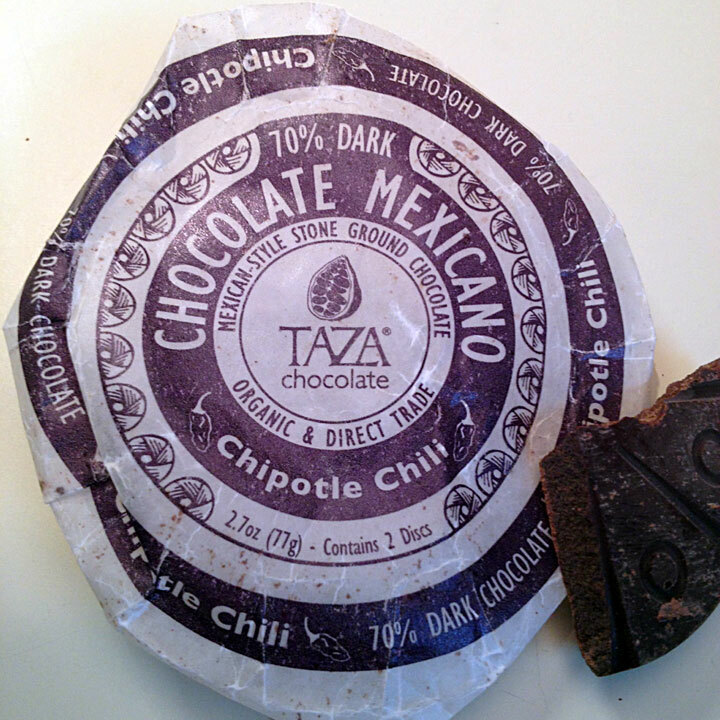 Interestingly enough, the wrapper for this chili chocolate also suggests whisking it into hot liquid (milk, water, what else?) for a traditional hot chocolate. And that reminded us of this mexican hot chocolate bar, which was billed as primarily for this purpose, and not really for eating. (Which of course we did anyway). This is a smaller bar for the cost, but aside from this feeble complaint, this is definitely worth trying if it crosses your path.